The natural fiber and phytochemicals in celery make important contributions to the health of your digestive system. 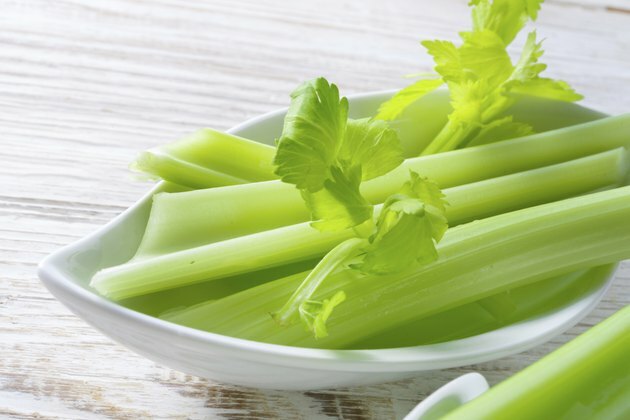 One stalk of celery supplies 4 percent of the daily value for fiber, based on eating 2,000 calories daily. Because it has equal amounts of soluble and insoluble fiber, you gain the full range of benefits, from preventing constipation to facilitating nutrient digestion and absorption. Celery also contains plant-based chemicals that may lower your risk for stomach inflammation and ulcers. The muscles in the wall of your small intestine contract to create two different types of movement. One type, called peristalsis, is the same as the muscle activity in the large intestine. During peristalsis, muscles contract in waves, which propel food and wastes forward through the intestine. In the small intestine, muscles also quickly and randomly contract in segments of the intestine, which churns and mixes foods. This action helps enzymes break down nutrients and ensures they come into contact with the parts of the small intestine that absorb nutrients into the bloodstream. Bacteria in the large intestine ferment some of the soluble fiber in celery. Fermentation produces a small amount of energy and short-chain fatty acids. One of these fatty acids -- butyrate -- contributes to the overall health of your gastrointestinal tract. It helps fight inflammation in the lining of the large intestine and keeps the gastrointestinal barrier healthy, reports a review in March 2011 issue of the "World Journal of Gastroenterology." An intact gastrointestinal barrier is vital because it's responsible for allowing nutrients to pass into your system while keeping bacteria and pathogens out. Insoluble fiber resists digestion, so it stays intact as it travels through your system. Along the way, it absorbs water, which ensures that stool maintains the proper consistency. In this role, it prevents constipation by keeping stool soft, but it can also boost consistency to help relieve diarrhea. The size and weight of stool increases due to insoluble fiber. This bulk is important because it pushes against receptors that stimulate muscles in the walls of the intestines, then they contract to push waste through the length of the intestines. For all the benefits you'll gain from fiber, it's also good to remember that too much fiber can cause gas, bloating and diarrhea. You can avoid unwanted side effects by adding fiber to your diet gradually until you reach the recommended daily intake of 25 to 35 grams. Fiber absorbs water, so as you increase fiber, be sure to drink plenty of water.